There was a tremendous turnout at this year’s fair, and while we expected some excellent projects, what you all brought to the NHTI gymnasium was better than we expected! Congratulations to all the students for jobs well done, and to our fair winners, Adyant Shankar from Nashua High School South, Ayush Noori from Phillips Exeter Academy, and Katherine Duan from Phillips Exeter Academy. See the whole list and pictures of the winners. The four NHSEE fair winners took their projects to the 2018 ISEF fair in Pittsburgh and had a great time! Click here for some pictures of NH’s own at the fair. You can read about the ISEF winners at the Society for Science website. Congratulations to the winners! 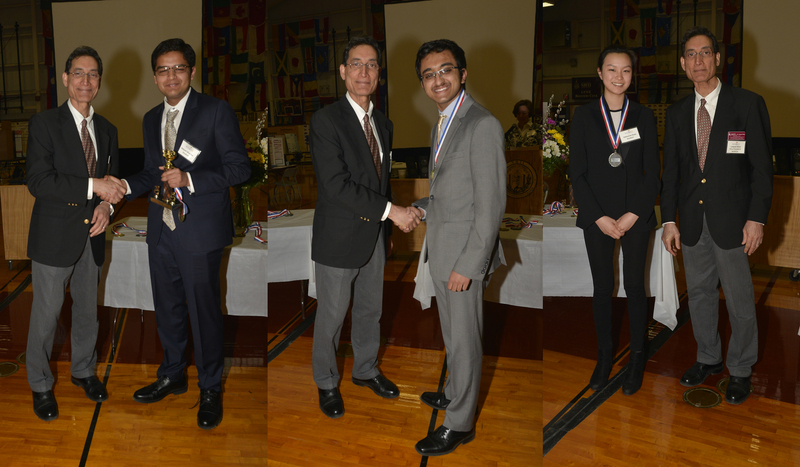 Regeneron Pharmaceuticals, Inc. (NASDAQ: REGN) and Society for Science & the Public the winners of the Regeneron Science Talent Search 2018, the nation’s oldest and most prestigious science and math competition for high school seniors. 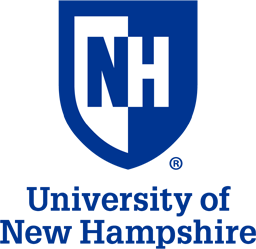 Vinjai Vale of Exeter, New Hampshire (who placed 3rd in the 2017 NHSEE), received a $70,000 award for creating a system that may improve the ability of convolutional neural networks (CNNs) to understand complex scenes. Congratulations to Vinjai and all of the students who did well at the Science Talent Search! If you missed this year’s fair you missed a great one. Here’s a quick peek at some of the competitors and the final awards presentation. The winners list can be seen here. Thanks to everyone who made this possible. We hope to see you there next year! 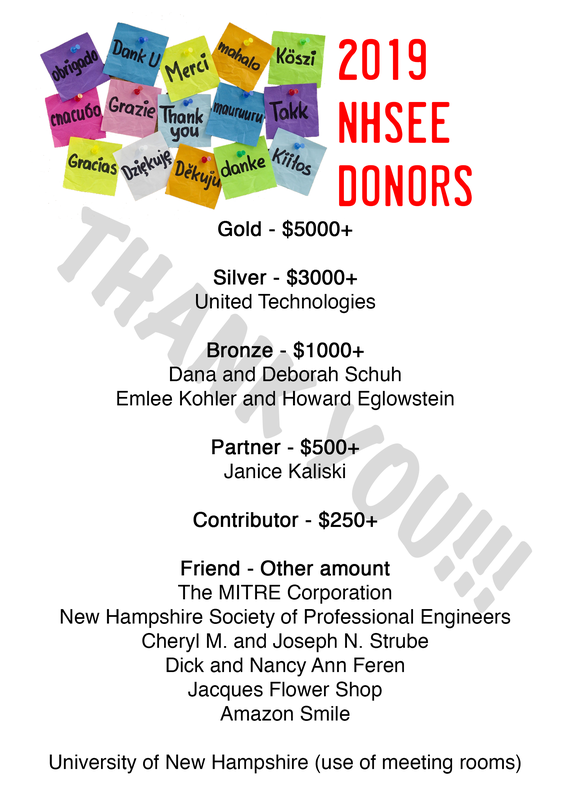 Of course, if you’d care to donate to our efforts or have your company sponsor the 2019 NHSEE, we’d love to hear from you (click here). Are you a high school senior with a great original research project? 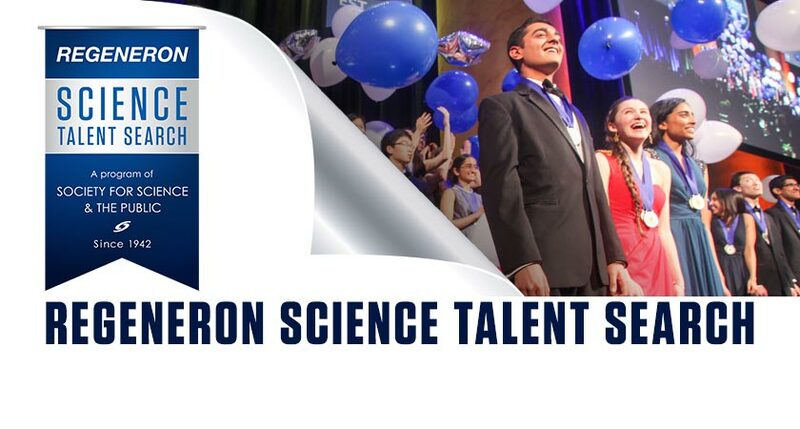 Now is the time to open an application to the 2018 Regeneron Science Talent Search, the nation’s oldest and most prestigious STEM competition for high school students. The online application is open now through November 15, 2017 at 8pm ET. The top 300 scholars will be announced on January 9, 2018 and the top 40 finalists on January 23. Questions? Email the society at sts@societyforscience.org for fastest response. The scheduling elves have been busy finding the perfect date for next year’s NHSEE Expo. The 2018 Expo is confirmed for Thursday, March 15 2018 at NHTI, Concord’s Community College. If the weather is a problem, we’ll see you on Friday, March 16 instead. It’s not too early to start thinking about your science or engineering project. You may still have a few days of school left or you can check in the fall to find your school’s science fair coordinator. Don’t miss out on the fun! It’s a great day to show off your ideas and hobnob with your fellow wizards, and perhaps take your project to international competition! Remember to mark your calendar for March 15, 2018! 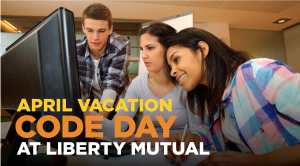 Liberty Mutual 2017 April Vacation Code Day! Motivated high school juniors and seniors who are interested in learning basic website design coding skills and want to learn more about technology careers. Learn more about a career in technology through hands-on activities, demonstrations, and guest speakers. – Student will need to sign a permission slip provided by Liberty Mutual prior to the event. – Students should expect to attend the event unaccompanied by teachers/parents. Email Alicia.Guthro@libertymutual.com if you are interested and qualify. If you missed NHSEE 2017, you missed a great fair! The big storm that NH and other parts of New England this week wasn’t enough to dampen the spirits of the science students who brought their projects to NHTI in Concord to compete for trophies, medals and bragging rights. We had some amazing projects this year and the competition was fierce for the top spots. Take a look and see how things worked out. Regeneron runs the annual Intel Corporation and the Society for Science ‘Science Talent Search’, and distributes $1 million to the winners. Mary Zhu was chosen as one of only 40 students in the country to compete for the top prize of $150,000. To be included in the search you have to have demonstrated ‘exceptional scientific potential in three areas: basic research, global good and innovation.’ Mary Zhu of Nashua High School South won 1st place at the 2016 NHSEE for her project “Food for Thought: A Novel Computational Approach to Modeling the Impacts of School Meal Policies”. It wowed the judges last year, then earned Mary a 2nd place showing at the 2016 ISEF fair in Phoenix AZ. We’re not the least bit surprised that this effort caught the attention of the STS search committee. Mary will be presenting her research project to national leaders/scientists and the public at the National Geographic Society , and will also visit Congress on her trip to Washington DC in early March. Nashua High School South also gets a $2,000 grant. You can learn more about Regeneron’s Student Science Search or see the press release. Please join us in congratulating Mary and wishing her the best of luck. Regeneron loves it when high school students take an interest in science. Without dedicated science teachers, this wouldn’t happen, so Regeneron is running a conference for science teachers. You can learn more about Regeneron’s Student Science Search or sign up for a chance to attend the teacher’s conference. The Regeneron STS Teacher Conference will take place September 30-October 2, 2016 in Washington, D.C. Attendees will be selected by lottery and will represent veteran, intermediate, and novice Regeneron STS teachers. One teacher per school will be selected. Attendees from last year’s conference and their schools may still apply, but new schools and attendees will be given preference. Sign up by August 10, 2016 for a chance to attend. A local NH company is offering an exciting opportunity to New Hampshire students. Fidelity Labs and Fidelity’s User Design Team are running a Technology Design Challenge! This is a one day event on Thursday, 7/14/16 from 8:30am-4:30pm. Start the day learning the basic principles of Design Thinking (as taught by the Stanford d.School). These techniques focus on building deep empathy for your customer and foster creative problem solving. Work in teams to apply the principles you learned to design and prototype a new product. Tour our award winning campus and see how we utilize technology for innovation. Meet with and hear from recent college graduates who have completed our technology learning and development program, Leap. Learn how to get first consideration for technology internship opportunities in Summer 2017! Cash awards given for the best design concepts. Applications were due by June 30. We hope you were able to get into this program. Truer words have never been spoken. Great advances in science have come from great scientists, but have you considered that these scientists were once students just like you? They had problems and failed experiments like you have. Most of them have never shown at NHSEE, but imagine if they had? The Teacher’s College at the University of Columbia did a study of 400 high school students. Professor Xiaodong Lin-Siegler found that students who read articles and learned about the personal struggles of Albert Einstein, Marie Curie and others were able to improve their own study habits and greatly improve their own performance in school. We truly do learn from watching others. We were inspired by reading Columbia University’s article about Professor Lin-Siegler’s findings and we think you will be too. After reading the article about the research, you’ll want to read the real thing. Her published article is on apa.org and you can read it here.